dbFront ships with a single theme and uses the content delivery network code.jquery.com to make the other themes available. Below you will find instructions on how to create and locally install your own themes. You can also disable the use of the Content Delivery provided themes. If you want to disable the use of the content delivery network then you can do so by setting the following configuration to false. It is always possible to hire someone to create a custom jQueryUI theme for you but one of the first things you should consider is using the jQuery provided Theme Roller. The Theme Roller allows you to start with one of their existing themes and then adjust it to suit your own needs. The URL for their theme roller is: http://jqueryui.com/themeroller/. Note: Keep a log of your changes for when a new version of jQueryUI is released. NOTE: It is important to keep a log of the changes you made to the theme incase you need to download an updated version. dbFront will be updated to use a newer version of jQueryUI in the future. dbFront looks for themes in the folder "themes" in the website folder. 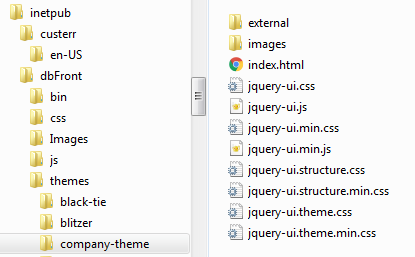 Each theme should be contained in its own folder. The name of the folder will be the name that dbFront displays to the user. You may want to keep the other files since they make it easy for you to review the theme if you make any changes. Once the theme has been installed you can then select it from the Database Preferences window.